Lets be honest, one thing that majority of passengers travelling on a long haul journey on Indian Railways dread – Uncleanliness on trains, especially the toilets. To add to passenger woes, the housekeeping staff is generally quite irresponsible, and complaints made to them fall on deaf ears. Indian Railways seem to have understood this problem and have come up with a simple solution. They will soon be introducing SMS based On-site Passenger Complaint Redressal System (OPCRS), which will allow passenger travelling to register complaints in regards to cleanliness in coaches, toilets and any other housekeeping problems faced during journey. Passengers will have to simply SMS their PNR number to a specific Shortcode ( DOT is currently in the process of allocating a 3 digit Shortcode to Indian Railways for this purpose). Once the PNR number is registered with OPCRS, the PNR number will be immediately routed by the system to the mobile phone of Housekeeping supervisor present on the train. Because all this happens in real-time, housekeeping staff knows about the passenger complaint almost immediately. The passenger also receives a confirmation on his mobile phone with a complaint ID number. Once the housekeeping staff on the train attends to the problem satisfactorily, the passenger needs to provide the complaint ID to them. The housekeeping supervisor will then send the complaint ID via SMS back to OPCRS system, which will then close the complaint. If the complaint ID is not given to the housekeeping supervisor by the passenger, it means that the problem is still open or has not been taken care to the satisfaction of passenger. The housekeeping supervisor then remains answerable for the open complaint. What I really like about the system is that being real-time, passenger complaint reaches to the housekeeping supervisor immediately. Not only that, supervisor also has to ensure that complaint is attended immediately to passenger’s satisfaction, so as to ensure closure of complaint. Open complaints are obviously going to be yard-stick on which housekeeping Supervisor and staff’s performance will be gauged. Kudos to Indian Railways for bringing in a much needed solution to probably the most pressing problem of Railway passengers. 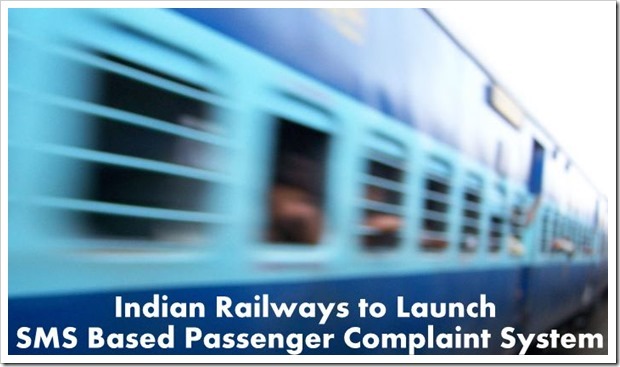 "Indian Railways to Launch SMS Based Passenger Complaint System", 5 out of 5 based on 1 ratings. Indian Railways in Assam is the worst….All Tuta Futa coaches are put into Assam or North Frontier Railways from through out India…!!! and the toilets are the worst…. Local train toilets are never cleaned in their life time it seems…… Phokat ka salary mil raha hain sabko……!! Guwahati Railway Station is the worst maintained…. I ve seen through out India…..!!! with the most unscientific constructions…. Wow that will be cool….I think you will agree with me k Indian Railway has been going digital for past few years…and this move will step the wheel for digitization one step forward…Indian Railway is understanding the need of the time..it’s a good thing for sure….so cheers to one of the most important financial organizations of our country…. I personally feel, this is just too much an effort. By default ALL train coaches are dirty, especially toilets. Period. They don’t need to be told about it. This is definitely required and I am happy that Indian Railways are moving forward and have started providing values to the passengers.